“The Beast” is one of Spalding’s offering in the portable hoops arena. It has a 60″ tempered glass backboard, steel frame, institutional style ScrewJack lift for height adjustment, and a 55 gallon base. Spalding boasts of The Beast’s unmatched construction, giving you the authentic feel of playing just like in the pros. This portable hoop system’s pretty popular, so in this review, we will see how it fairs, and if it is worth your money. Installation can be quite difficult especially if you are alone. Having another person or more is recommended as this is a very heavy goal. Take note that the backboard is extremely heavy so take caution when attaching it. The manual that comes with it is pretty clear and easy to follow, but the actual installation itself requires a bit of work. The poles are quite heavy and being put together requires effort. The post difficult part is attaching the backboard to the mounts. 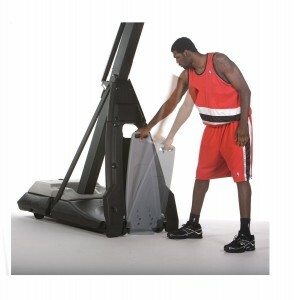 You might want to use a sturdy object to support the backboard, as it is very heavy. Height adjustment on this hoop is a breeze. However, some have reported that after some time it can start to become heavy. Putting some WD40 should do the trick in making it adjust smoothly again. The ScrewJack Lift System uses a handle that you could pivot to adjust the goal’s height. It can be adjusted from 7.5 feet up to 10 feet. Despite it’s heavy weight, moving it around in a flat and relatively smooth surface is quite easy. The gray plastic in front acts as a handle and when pulled out, will also bring down the front wheels. However, due to it’s weight, it can be quite impossible to move this in grass and dirt surfaces. Professional looks and high quality build, this is quite possible the best looking and most durable portable hoop basketball system in the market. Spalding knows what they are doing when it comes to hoops. The Beast is not perfect, but it is without a doubt the best in its class. The installation and leaking base are worth taking note of but despite its faults, this portable hoop system is really worth every penny. 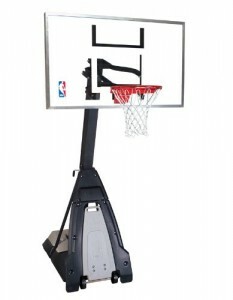 From the build quality, aesthetics, ease of movement and adjustment, you are looking at a basketball system that is almost as good as professional goals.